Yooohooo!!!! you heard me clear. Lately, Gensan [My hometown] was been visited with so many opportunities. And I’m glad that after the isolated news that was brought and given out by others to the impression of Gensan or in any other parts of Mindanao, there are still many investors, entertainments held in our place. My Hometown is known because of the Legend Champion Manny Pacquiao ‘Pacman’ for his boxing career. Any where his fights held they have spoken and kinda advertise General Santos City. It's an honor too. Let’s go back, famous and popular Sarah Geronimo winner in a song contest, will be having her first time concert here in GenSan. I can’t wait, I so love her songs and the way she sing, she’s pretty much incomparable and I think watching her concert is a worth it for. 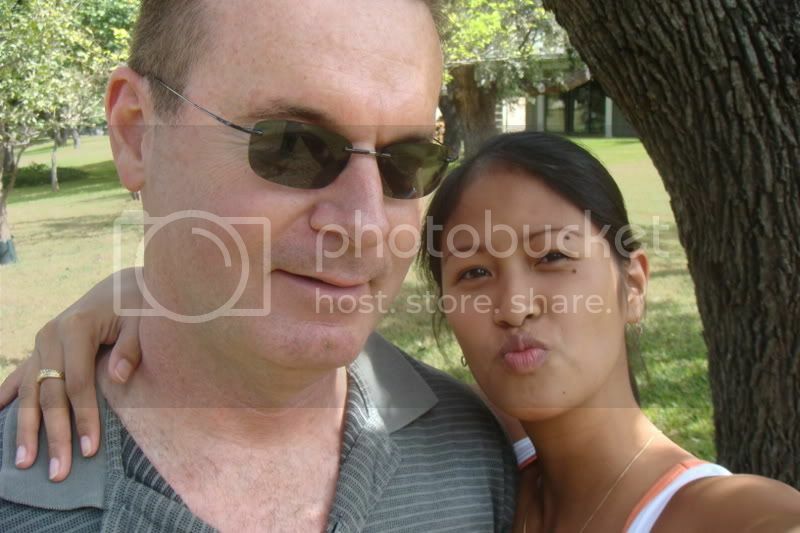 I’m still thinking of whom will I be asking to go with me, probably my sis-in-law since she likes her too. 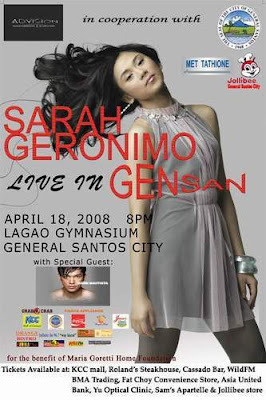 It will be this coming April 18, 2008 at Lagao Gymnasium, meaning just a walk away distance from my place. I won’t be hassle to get there early in order to get a good view. Hay.. I can’t wait for it.. and so much excited for that day. Isn’t that great? Novs, yay si sarah paborito ni eury- pityuri jud novs! hehe! good for you there sulti gani akong kuya mu concert daw lagi si sarah- pastilan tinood jud diay abi nko binuang ra niya hehe!. Sikat na gyud ning bataa woi. Maayo gani kay buutan bataa dili hambugeraon. nganu diay Avon imo man gihubo u shoutbox? daghan spammer? tuod dapat proud jud ka sa mong yutang natawhan kay bisan pobre makamingaw pud baya labi na inyo nga naa diha gikan si Mamakyaway,Manny ba? she's really talented and she have the nature ability on how to give satisfaction to her audience.. i'll post pix for this soon..
girl, thats okay the important is that you have visited me now, busy maybe with the life? Hi, salamat sa paglabay sa akong payag. Kaswerte nimo oy kay makakita man ka ni Sarah. I love Sarah too. She's nice and nindot kaayo iya tingog. hello sis! musta na kaw? tagsa na lang ko blog hop ba kay busy life. for sure, nice jud ning concert ni sarah ba. hope i can watch this one. ingatz sis. Hi Novs, salamat sa bisita. Oi, pila pud ang tickets ani? can't wait for her day here..